Many people don't even realize what gum disease is, what it does or what they can do to prevent it. The truth is, periodontal disease is a swelling in the tissues of the gums surrounding your teeth. 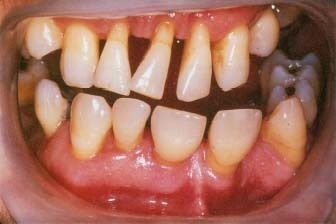 Gingivitis is the inflammation of your gums. This can cause your gums to bleed heavily when brushed, even very lightly, and can cause sensitive nerves in your teeth and sharp, aching tooth pain. If left untreated, it can turn into periodontal gum disease. Periodontal disease is what gingivitis can turn into if not cured in time. This is a lot worse than its predecessor as periodontal disease can cause tooth loss. The main cause of both types gum disease is plaque. Plaque is gathered on our teeth from the food we eat and, if not brushed away during teeth cleaning, gathers up and causes bacteria to harvest. These harmful bacteria cause tooth decay. You can easily reverse gum disease in its early stages, such as gingivitis. With the later stages though, like periodontal disease, it is not so easy.